Flower centerpieces have long been favorites with many people because they make such a great accent on a coffee table or for a dinner table setting. Fresh flower centerpieces make a great floral gift for a hostess preparing for a dinner party or perhaps to wish a loved one a happy birthday. Flower centerpieces can enhance any setting no matter what your home décor. Flower Giving Statistics: The Michael Cohen Group has done research that shows just how much people love to give and receive flowers. Their findings gives us great insight into the world of giving flowers. Of the hundreds of men and women surveyed, most described a gift of flowers as unlike any other because flowers create lasting memories and make people – both givers and receivers – feel cared about and special. 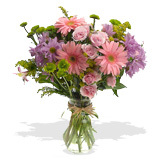 The fleeting nature of fresh flowers also encourages people to appreciate flowers when they are beautiful and vibrant. "With a gift of fresh flowers, you know that someone is thinking of you right now, this very minute," Cole said. "It's the memory of the flower gift and the emotions that last forever."